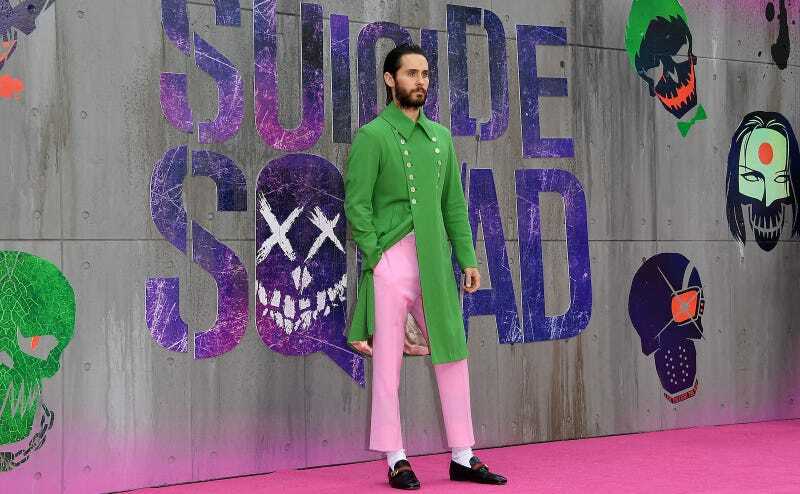 After Jared Leto bodied his Gucci pirate look at Tuesday’s Suicide Squad premiere in New York, and after I stopped cry-laughing from this incredible tweet, I was forced to recognize that Jared Leto is seriously doing his thing. Whether or not you like that thing is up to you, but we must give him credit for his dedication to it. At the European premiere for Squad in Europe, Leto was not to be outdone (to himself). Wearing Gucci again, with the same high-waisted trouser cut and supple driving shoes that look made for a person whose feet are never actually supposed to touch the ground, he worked those neons with the dandyness of a precious French prince. As Jared Leto would surely tell you if you didn’t already know, he is now a method actor, having prepared for his role of the Joker by watching lots of violent footage and being mean to his coworkers. In his last two outfits, it’s hard not to wonder whether he is auditioning for the role of Jason Schwartzman playing Louis XVI in Sofia Coppola’s Marie Antoinette. As GQ points out, this dude’s been fully enveloped by the Gucci experience, but I’m not so sure that it’s just, as they put it, a case of Leto “meeting his style match.” I believe he is working on a role. But which is it? The Outsider, his forthcoming film in which he plays “an American former G.I. who joins the Yazuka”? Or is it for Berlin, I Love You, an “anthology feature of 10 stories of romance set in the German capital”? Or is it for the much-anticipated 2017 reunion of his band, 30 Seconds to Mars, “an American rock band from Los Angeles, California, formed in 1998"? Only Jared knows.